Arsenal were back in Premier League action with a Monday night game away at Watford. It was another key game in the race for the Champions League spots and Unai Emery’s team were well aware that they would be in for a very difficult match. The match began with Arsenal looking to play at a high tempo in possession and press high off the ball. That hard work paid off early doors when Pierre-Emerick Aubameyang pressed Janmaat and forced the defender into the back-pass. Foster thought he had more time than he really did; Aubameyang sprinted from outside the box to close him down and deflected the goalkeeper’s clearance back past him and into the net. Just a minute later, Deeney was sent off. The home side showed their resilience and spirit and took the game to Arsenal, despite being a man down. Cathcart struck the woodwork and Bernd Leno did well to get a strong hand to a dangerous Capoue free kick that was heading inside his left post. The second half saw Arsenal soaking up Watford pressure and as the game began to get stretched the Gunners looked to take advantage of space on the counterattack. Masina came close to getting the equaliser for the home side with a shot that hit the angle, and Ainsley Maitland-Niles covered excellently to stop Gray scoring after he’d rounded Leno. 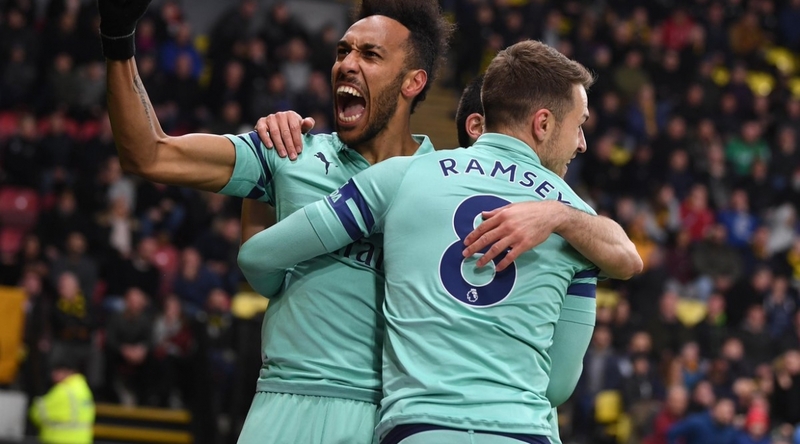 Aubameyang missed a late chance to seal the win with a second, but his early goal was enough to take three important points in the race for the top four. Arsenal now turn their attention to Thursday night’s away game in the Europa League against Napoli.